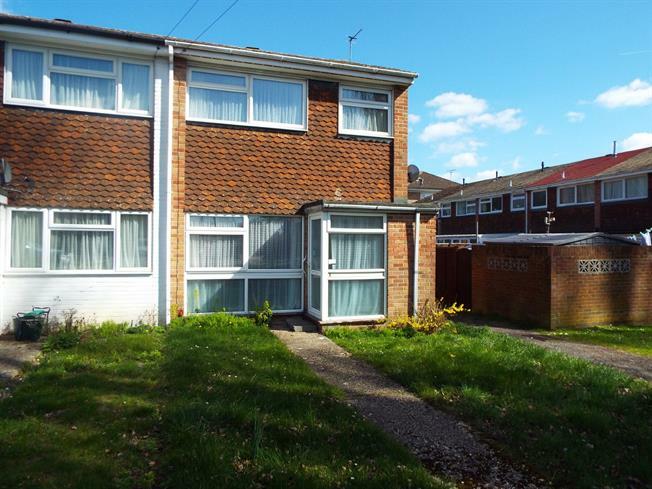 Terraced House For Sale in Tadley for Asking Price £265,000. This extended end terraced property comes to market with no onward chain. The property offers an entrance porch with storage cupboard and door into the lounge/diner from there you have access into a good sized kitchen, from the kitchen the property has been extended out giving a rear lobby area with access into the shower room and access to the side of the property. On the first floor there are three bedrooms, the master bedroom have built in wardrobe, two further bedrooms and the family bathroom with toilet, wash basin and panelled bath with an independent shower over. To the front there is a small lawn area, to the rear there is access into the garage from the garden which is mainly laid to lawn.